I realize James Taylor isn’t exactly a really hard rockin’ live artist, but he does put on a great show nonetheless and always has a great band with him. I just can’t understand how REO and .38 Special, who haven’t done anything in how long (Or at least nothing most people have heard or anyone cares about ??) are somehow headlining over JT? Then again, Terry Jacks, Bread, Eric Carmen, and STARLAND VOCAL BAND (Seriously??) are even stranger, kinda laughable, inclusions. Now throw in a bunch of tribute bands — and a Bowie HOLOGRAM (Who the hell authorized that??) — and this whole thing comes off as pretty sad. Maybe they’re paying JT a ton to be there. He’s got his tour with Bonnie Raitt this summer, and some dates with Paul Simon too, so he doesn’t really need this. Must be a cash grab. I can’t really see who this would appeal to. 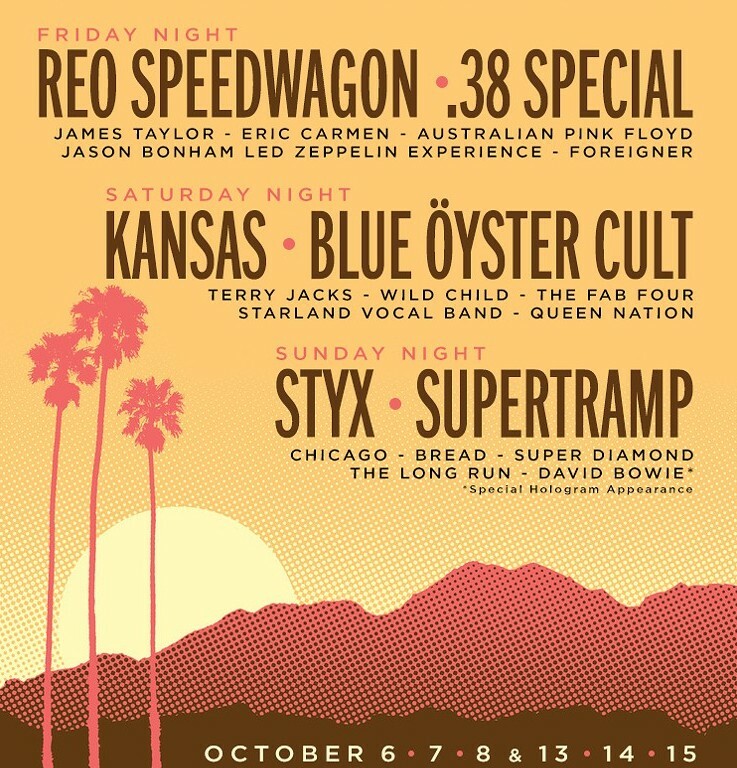 This certainly isn’t like that festival a year or two ago that had McCartney, the Stones, Dylan, Neil Young, Roger Waters, etc. Is there anyone just dying to see this festival? Yes, me. I would love it. I bet a lot of people would. It is the end of an era, now leading us into a time full of crazy people. I don’t know anyone who wouldn’t want to go back to that time for a while, even if only through music. I saw 38 Special a few years ago. They put on a great show ! I say if you can still draw a crowd then by all means get out there for the fans and put on the best show you can…I think this is a fairly good mix of artists that is sure to bring out fans of all ages..there is a little of everything here..if the price is right most people looking for a night or two of musical entertainment and a chance to forget about their personal daily grind for a few hours would probably go. This is why they’re called classic bands & artists. These guys are now well into their late 60’s & early 70’s. In their heyday they were massive but now? No. But seeing them live to me would be a bonus, their studio output is next to nothing. The only bonus for 38 Special fans was the killer Don Barnes solo album that finally came out in 2017 Ride The Storm. Living on past glories most definitely & why not?